Chester County Sheriff Carolyn “Bunny” Welsh and Chief Deputy Sheriff George P. March scan the tree for their favorite ornaments from a collection handcrafted by March’s mother, Alice March, who died in September. 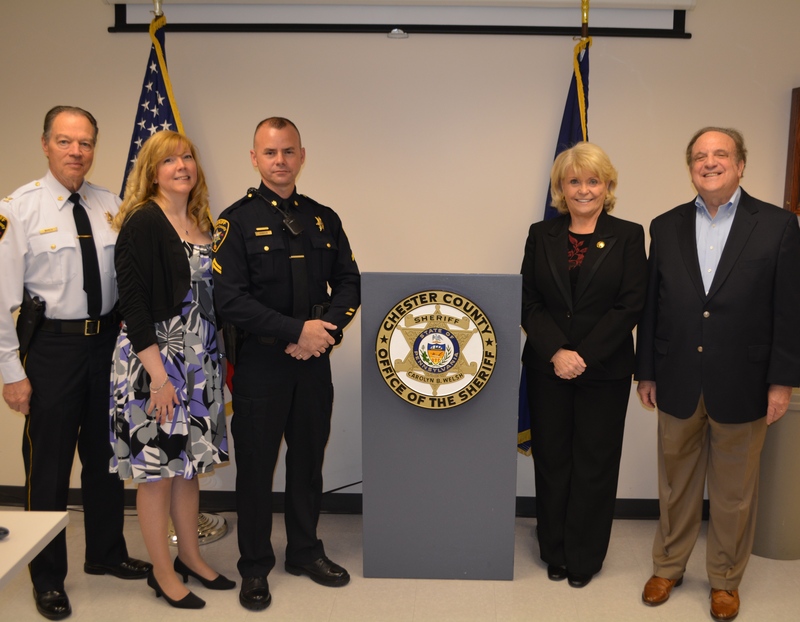 The “aha” moment came around Halloween when the newest employee of the Chester County Sheriff’s Office commented on the decorations. “That’s nothing; wait till you see this place at Christmas,” Chief Deputy Sheriff George P. March said he was told. The passing remark would set up a dramatic holiday décor change for the office. March, who had lost his mother a month earlier, was in the throes of helping to divide her possessions among family members, including a voluminous collection of handmade Christmas ornaments that had taken decades to create. For years, March said his mother annually crafted three or four for each of her five children, a network that later expanded to include nephews, nieces and grandchildren. Alice March also kept some for herself, he said. 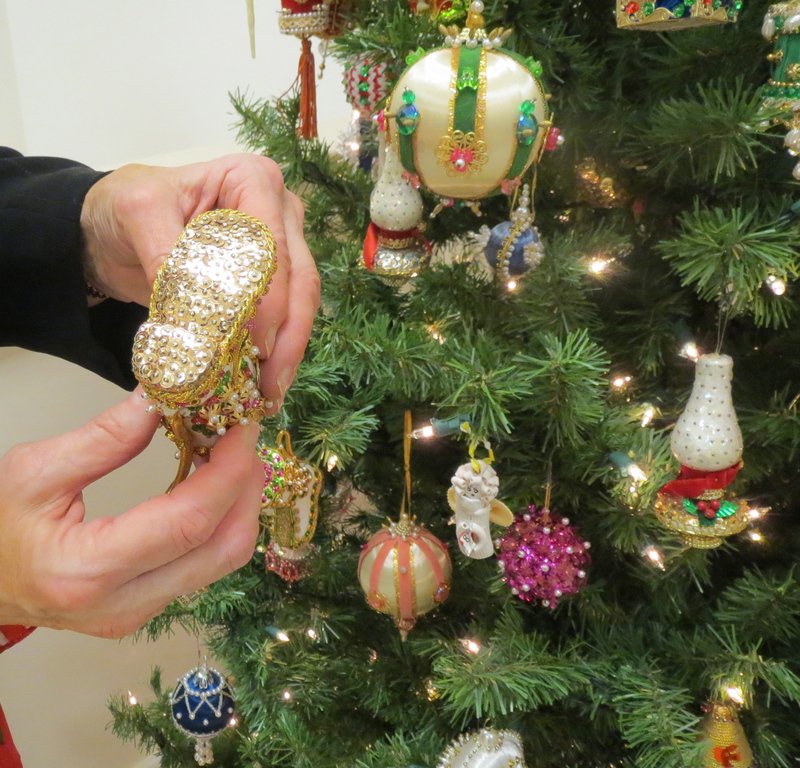 Chester County Sheriff Carolyn “Bunny” Welsh shows the intricate detail on the bottom of one of the newly acquired Christmas ornaments. So when it came time to distribute the remainder, most relatives already had an ample supply of the coveted decorations – lovingly assembled from materials ranging from pasta and cinnamon sticks to Styrofoam and sequins. As a result, the stash of several hundred did not diminish much, March said. 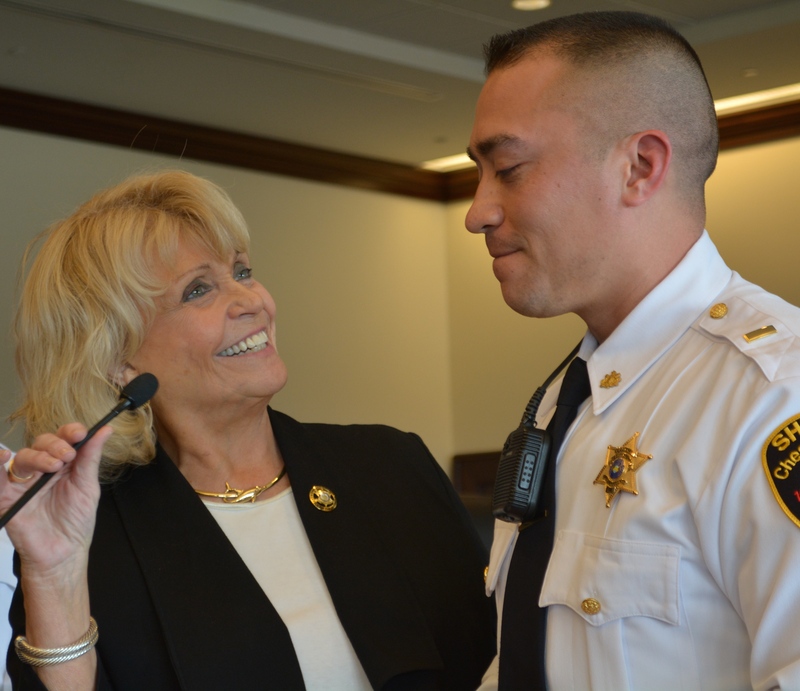 Maybe Chester County Sheriff Carolyn “Bunny” Welsh could use them. Anyone who has ever walked through the Sheriff’s Office in close proximity to any holiday knows that Welsh would not turn down such an offer. However, it did present a challenge: The glittery, elaborately beaded creations represented a design departure from the red, white and blue-themed tree that had always anchored the sheriff’s front-door display. Never a proponent of the “less is more” school of festive decor, Welsh crafted a solution that added March’s sparkling embellishments without sacrificing the patriotic theme. 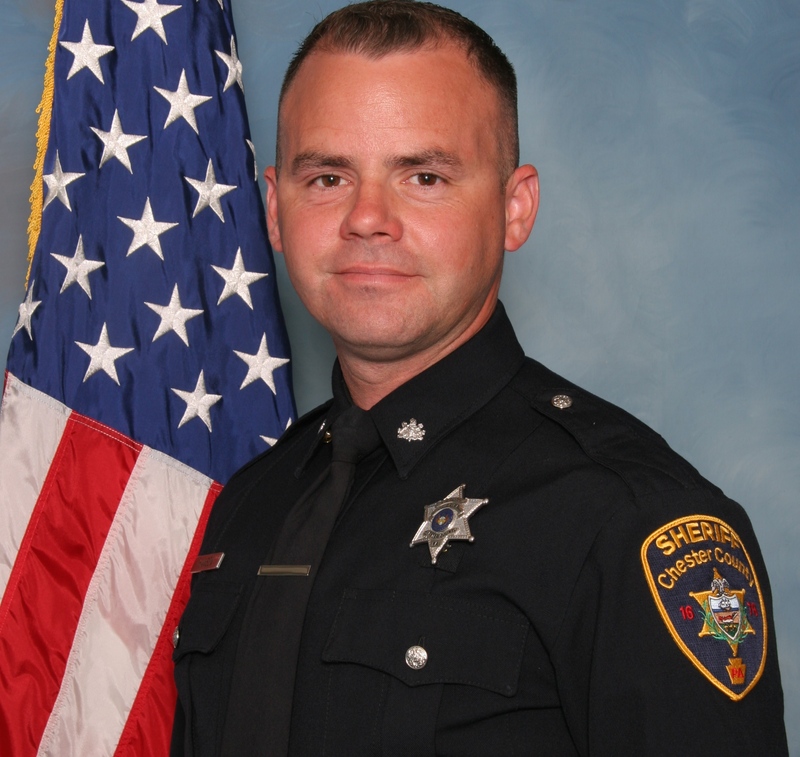 The tree was moved to the inside lobby of the Sheriff’s Office, where it serves as “a tribute to the entire March family,” Welsh said. 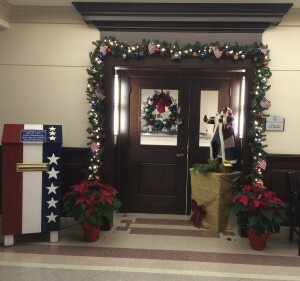 The Chester County Sheriff’s Office patriotic holiday door display in the lobby of the Chester County Justice Center is now anchored by a new box, where residents can deposit U.S. flags they want to retire. 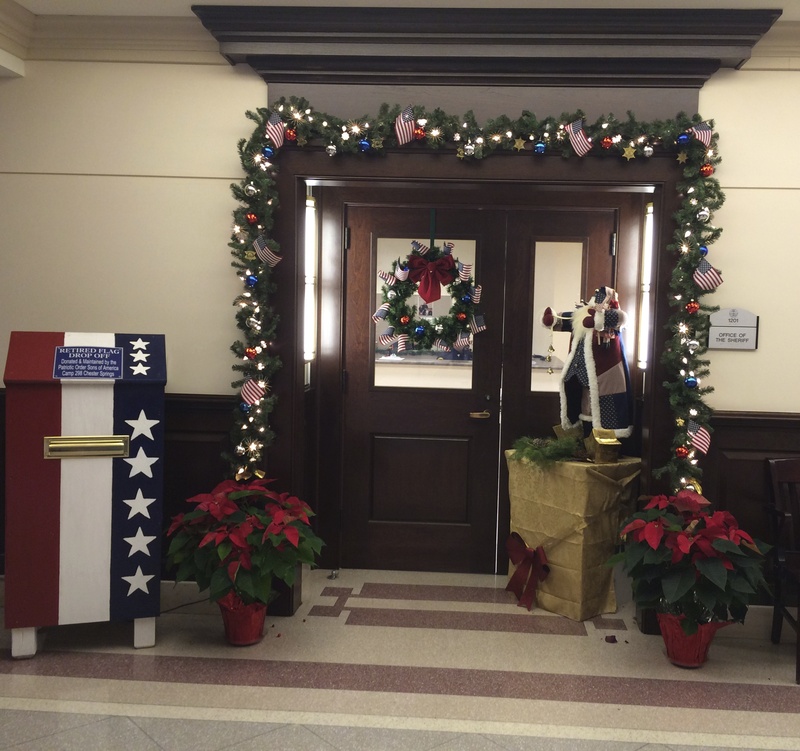 Outside the office door, a recently acquired box for residents to deposit worn U.S. flags sets the tone in bold red, white and blue, enhanced by a flag-festooned garland, wreath and Santa. Carefully cradling a small, beaded boot, Welsh turned it over to show the intricate work on the bottom. Then she demonstrated how an oil lamp replica was built so that it revolves. “When we first unwrapped these, I couldn’t believe it,” she said, explaining that she lined them up on a table so she could photograph them. March said the opportunity to see other people react his mother’s handiwork has given him a new appreciation for the ornaments’ artistry. “I’m definitely looking at them differently now,” he said.